The great names of the Napa Valley carry just as much weight to fans of the wines as those from the storied growing regions of Europe. Mondavi, Araujo, Ridge, and the rest cause just as many heart-flutters as Lafite, Latour, and Margaux. On both sides of the Pond, they all set the standard for quality, prestige, and ageability. 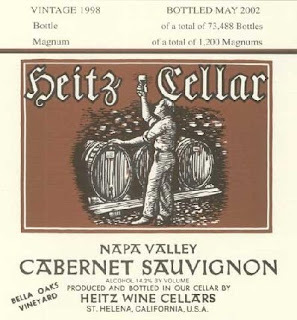 Recently, at the monthly meeting of a wine club I’m a member of (more on that in an upcoming post), I had the chance to taste a wine from another of Napa’s legendary producers: Heitz Cellars. In this case, it was the Bella Oaks Vineyard Cabernet Sauvignon 1998, a wine that not only exceeded my expectations, but that also brought to mind, in any number of ways, everything that made the greats of the Valley such stars in the first place. Even at nearly 11 years old, it still exhibited a fantastically dark color, with just a touch of age showing at the rim. The nose was a deep, mesmerizing well of eucalyptus and sweet tobacco, and the juice itself still maintained an amazing sense of weight and density. That eucalyptus note followed through from the nose and was joined up on the palate by red currant and a hint of spice. After the dramatic initial wave of the finish it tapered off quietly, leaving nothing but the memory of a structured, elegant, aromatically fascinating wine at its peak right now.